Earlier this week we had the pleasure of staying at the TradeWinds Island Grand Resort on St Pete Beach in Florida. This fairly large resort is the pet-friendliest hotel we’ve ever encountered so far on our travels. It features a Pet Play Zone – an off-leash fenced area complete with fire hydrants, tables and chairs, and room for your pet to run around. 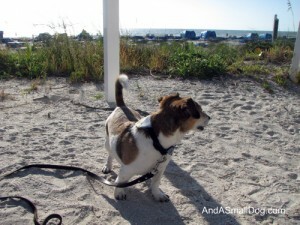 The resort also has a designated pet walk area that goes around the waterway, over a bridge, and past the dunes on the beach. Pets aren’t allowed on the beach itself, but there is a roped off area with sand and a hammock to make your dog feel like he’s on the beach! 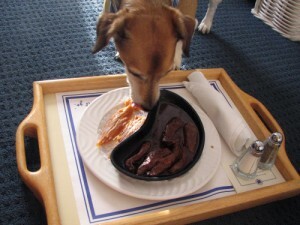 One of my dog’s favorite things about this resort, however, is the doggie (and cat) room service! Each species has three gourmet meal choices including Mutt Meatloaf and Kitty Kasserolle. Read my full review of this pet-friendly resort on Examiner.com – Beach vacation with a dog – the TradeWinds Island Grand Resort at St Pete Beach Check out the slideshow and video at the bottom of the Examiner article! If you would like more information about this resort, or would like to request rate information or make reservations, please email me. I am a travel agent specializing in pet travel and I can help you with all your travel plans! Check out the full review on Examiner.com featuring a slideshow and video of the resort! Or watch the video on YouTube!